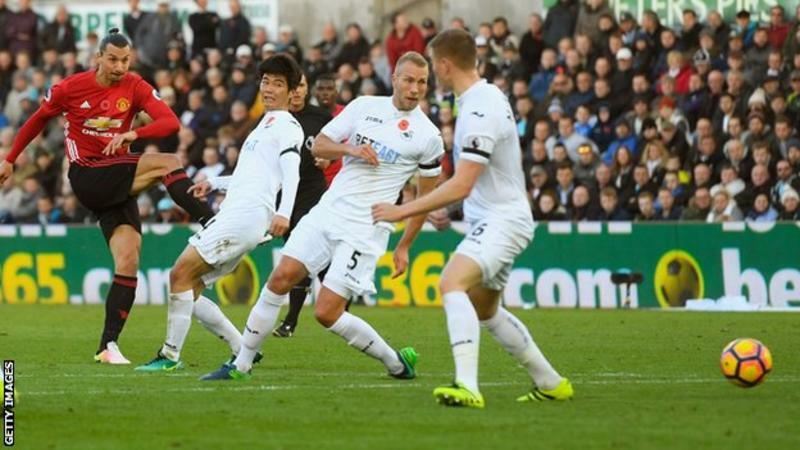 Zlatan scored for the first time in two months and United won for a first league match in four as a semblance of normality was restored at Swansea. The much needed win was welcome relief for Jose who watched from the stands as the side faced a ramshackle Swansea side in charitable mood. Rarely have United won so easily at a venue that has been far from a happy hunting ground. The team rediscovered our early-season swagger - albeit against abject and lacklustre opponents - and the performances of Zlatan, Paul Pogba and captain Wayne Rooney will have sent United into the two-week break in high spirits. It was our first win in the league since the 4-1 against Leicester on the 24 September and Zlatan's first since the Europa League victory over Zorya that followed five days later - a career-record drought of 525 minutes. The big man picked up a booking that means he will be suspended for the visit of Arsenal, United's next game on the 19th November, after the latest international break. Getting a result at Swansea has proved difficult and hard to come by in recent years for us so comes as a welcome and confidence boosting win but inconsistency has been our downfall so far this campaign. The victories over Leicester and the League Cup win over City have starkly contrasted the defeats to Watford, Chelsea, Feyenoord and dropped points against Stoke and Burnley, two games we should have won at a canter. There have been a number of factors behind the frustrating up-and-down nature of our season so far. Lack of anything that resembles a settled, first choice starting XI, a recent catalogue of injuries and Jose's professional (and personal) problems have all been reasons behind the failure to find any sort of winning formula. We've not had successive, back-to-back wins since August but yet victory over Arsenal would leave us only three points behind Arsene Wenger's side and with favourable fixtures on the horizon. After facing Arsenal, we host Feyenoord in the second of four home games on the spin followed by two matches in three days - League and Cup - against a struggling West Ham side yet to find the form of last season. Beating Swansea is fine and all well and good but will mean little if we fail to back it up with further victories from these fixtures. Despite Zlatan's absence - step forward Marcus Rashford (who scored twice on his league debut in the fixture last term) - both United and Jose have superb records against the Gunners and another win this time around would be our most significant victory of the season so far.